I was hoping some of you might be able to chime in, with compatible sized nibs for the larger nibbed Conids? I have heard others putting n vintage MB nibs in them, and I was curious what other nibs may fit. Would a Visconti Dreamtouch palladium nib fit? How about a Pilot #15 nib? I am aware that Bock makes many nibs out there for other companies, but their specific dimensions may be proprietary. Both you mentioned are too small. You need a nib with a wider base. The Bock nibs and MB nibs are all I have seen fitted to the kingsize Conid pens. I've fitted a Jowo 6 in the bock feed. The Jowo is a very tiny bit wider but it worked for me. Doesnt Bock make Viscontims nibs? I may remember this wrong. And I think the Kingsize is the only model using a #8 nib, so you can use a #6 on the regular of minimalistica. And to the original question, I dont think Conid uses a proprietary size, so any correctly sized Bock nib should work. Some of my Conids even came with a standard Bock branded nib. Conid isnt a big enough manufacturer to pay for custom sized nibs though they do have some custom branding. And I think theres a nib compatibility page buried somewhere on Conids site. If not and you have something specific in mind, just send them an email and theyll let you know. I hope to see what you end up with. Yes, you are right on all counts. I guess I just took the "larger nib" comment to mean kingsize Conids. Youre right; I read too fast and missed the larger comment. Hopefully my comment will be useful to some future reader if not the OP. If you have something specific (nib) in mind, contact Conid about it. They will make a section according to that nib (at an extra cost). Someone I know is in the process of getting a kingsize with M1000 nib so it can be done. Thanks for the info. I've always thought about getting a Sailor KOP nib on a Conid kingsize. You're welcome. Where are you going to get a KOP nib from? I already have a KOP right now. I'm thinking about getting another KOP anyways, so I figure I could put one of the two nibs in a Conid if needed. You can't fit a Pilot #15 on the Regular or the Minimlistica because it has a special shape in the section, I've already tried without success. But you can fit a MB 146 vintage nib from 50's, I put an OB on a Minimalistica and it's just perfect. Ive used Waterman Emblem and MB 149 nibs on my Kingsizes, and (vintage) 146 nibs on the regular. All required special collars for the feed, but Conid were happy to supply them. I provide only an ebonite housing. 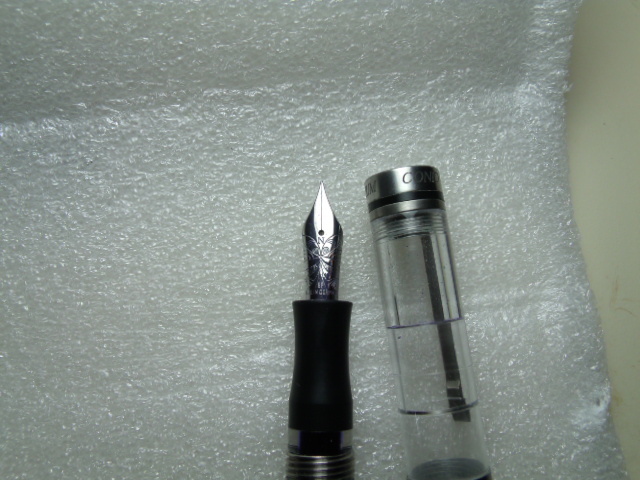 You will insert your Platinum 3776 nib and feed into the housing, and then screw that assembly into the pen. Price is $10, plus $3 shipping in the USA, $9.50 in Canada, or $13 overseas. If this is acceptable, I can send you a PayPal invoice and ship upon payment, as this housing B3776E, is in stock. Edited by Lloyd, 31 January 2018 - 17:53. Early this year I ordered a Conid regular demonstrator bulkfiller without a nib. I had some #6 stainless steel nibs. In the Conid, I tried a F-C EF, a Goulet EF, an Edison EF, and a Nemosyne nib. While all these nibs fit nicely in the Conid, I favor my Nemosyne EF nib in my Conid. Edited by mx-fan, 24 June 2018 - 23:45. If it matters, F-C EF, a Goulet EF, an Edison EF, F-C EF, a Goulet EF, an Edison EF are Jowo while CONID uses Bock. Why do you favor the Nemosyne? Why do you favor the Nemosine? The Nemosine just has a slightly finer EF than the other ones. Edited by mx-fan, 26 June 2018 - 00:14. I heard this weekend that you can contact Conid and buy a modified housing designed to fit the nib of your choice. Including Jowo, Pelikan, Montblanc and probably others.